For a simple, elegant treat that couldn't get much easier, I make up a batch of these chocolate truffles. I normally use milk chocolate, but good quality semi-sweet or dark chocolate should also work. I prefer to purchase my chocolate in bulk blocks. To melt the chocolate, I chop it into uniform pieces and melt in the microwave or in a heavy bottomed pan or double boiler. Place melted chocolate in a medium-size bowl. In a 1-quart saucepan, scald cream. To scald the cream, you heat it just until a skin forms on the top – do not boil. You can see the skin in this photo. It looks as though a piece of plastic wrap has been stretched over the surface. Remove from heat and let cool five minutes. Stir vanilla into cream. Beat the melted chocolate with an electric mixer. Stop mixer and pour in cream all at once over chocolate. Continue beating, cleaning sides and bottom of bowl several times with rubber scraper, until mixture is smooth and well-blended. This takes no more than 1 to 2 minutes. Pour into prepared pan and refrigerate 8 hours or until firm. Cut into 1-inch squares by lifting the block of truffles out of the pan and slicing them on a cutting board. 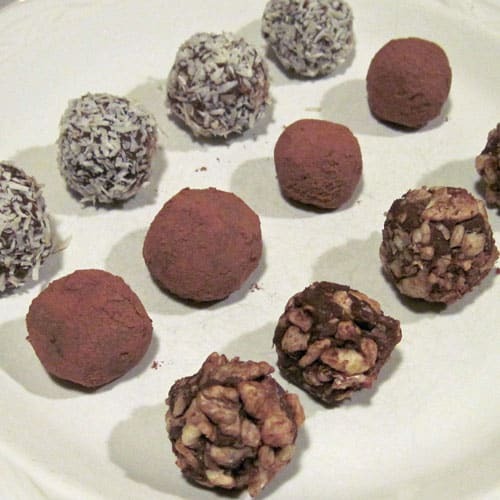 Alternatively, you can cut them in squares to portion, and then form the portions into balls and coat with your choice of chopped nuts, cocoa powder or coconut, as shown in the top photo. Serve immediately or store in refrigerator for up to one week. These are very soft and delicate, and will melt in warm conditions, so they are best removed from the refrigerator right before serving. Makes 64 pieces. The boys love these treats. They taste better than the best fudge you've ever had – very chocolately, but very smooth in texture, not gritty as fudge can sometimes be. I usually save them only for special occasions, like Christmas or Easter. If you need a vegan version, you can check out this post at SB Canning. Chocoholics may also want to take a peek at my favorite brownie recipe and cocoa mocha cookies. I hope you enjoy this simple treat. To melt the chocolate, chop it into uniform pieces and melt in the microwave or in a heavy bottomed pan or double boiler. 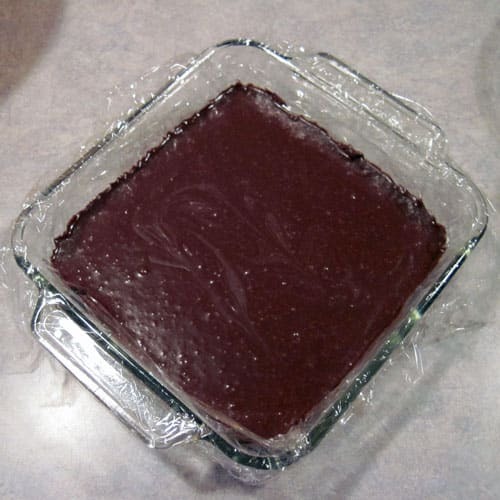 Place melted chocolate in a medium-size bowl. In a 1-quart saucepan, scald cream. 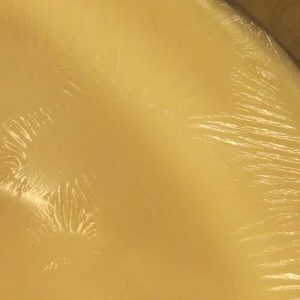 To scald the cream, you heat it just until a skin forms on the top – do not boil. It looks as though a piece of plastic wrap has been stretched over the surface. Remove from heat and let cool five minutes. Stir vanilla into cream. 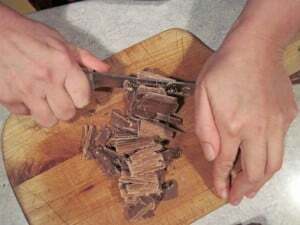 Cut into 1-inch squares by lifting the block of truffles out of the pan and slicing them on a cutting board. Alternatively, you can cut them in squares to portion, and then form the portions into balls and coat with your choice of chopped nuts, cocoa powder or coconut. Serve immediately or store in refrigerator for up to one week. These are very soft and delicate, and will melt in warm conditions, so they are best removed from the refrigerator right before serving. Makes 64 pieces. I love this recipe! I gotta make these for my mom’s birthday lunch! is there a way I can print this up? Thanks a bunch! I’m pretty primitive, so I haven’t figured out how to add a neat recipe card format. When I find a recipe I like on a site, I typically cut and paste to a word processing program and print from there, including the link so I can go back to the site and find more recipes or give credit if I later use the recipe in a post. Organic dark chocolate baking blocks were on sale today at the store. 🙂 Happy dance.